We are committed to keeping you updated with Educational Reform and offering you the best advice to support your students with SLCN. We ensure the information we provide you is current, accurate and above all useful! You can find lots of information on our termly SENCo hub meetings here and free resources to download here within the schools resources section. Our latest back to school resources are available here fresh for the start of the new year. You can spot purchase this service at the beginning of a term with no tie ins. Our highly specialist SLT team will screen all students with SEN or those selected by you – you select the number of spot purchase days you require. We will complete full standardised assessments, informal assessment and classroom observation and then present you with a full SEN SLT report within one week of assessment and present back personalised targets and teaching strategies to support each child’s presenting SEN.
We will outline any steps a student might need in respect of the code of practice, providing the supporting evidence you need. We can repeat baseline assessments for you in future months to measure progress, however there is no obligation to tie in to our service. We can provide a free SEN provision mapping consultation to your school: this will outline whole school approaches and environmental strategies you could implement in order to cater for children with Speech, Language and Communication needs. Provision management can be used strategically to develop special educational provision to match the assessed needs of pupils across the school, and to evaluate the impact of that provision on pupil progress. Used in this way provision management can also contribute to school improvement by identifying particular patterns of need and potential areas of development for teaching staff. It can help the school to develop the use of interventions that are effective and to remove those that are less so. It can support schools to improve their core offer for all pupils as the most effective approaches are adopted more widely across the school. 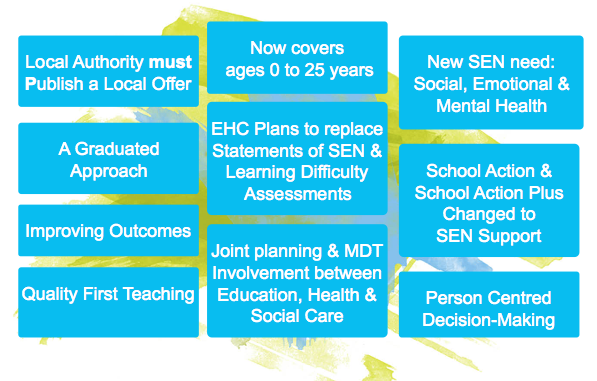 The new SEND Code of Practice came into force in September 2014, and since then we have been delivering SENCo Training Hubs throughout the country to inform schools about the changes. We have outlined the key information provided within the SEND Code of Practice. The latest version of the SEND Code of Practice was released in January 2015 and is valid from April 2015. You can download a copy from the Department for Education Website or you can download a copy from our resources area. Information about The Local Offer and links to each local authority can be found here. It outlines that teachers must use their best endeavours to ensure that they provide for all children including those with SEN.
High quality teaching that is differentiated and personalised will meet the individual needs of the majority of children and young people. Some children and young people need educational provision that is additional to or different from this…Special educational provision is underpinned by high quality teaching and is compromised by anything less. You can find more information on high quality teaching on the SEND Gateway. By April 2018, all Statement of Special Educational Needs should be transferred to Education, Health and Care Plans (EHC Plans).